We Have a new 741 . Our new 741 is a1983 Salisbury Heavy Rescue. Donated to the McGraw Fire Dept. Fron the Terry Ferrell firefighters fund . And the Mt. Sinai Fire Dept. This Rescue is in mint shape . We Thank the Mt. Sinai Fier Dept. for their help. The Help from Mt. Sinai Fire Dept. Means so mutch to us. Thank You. The McGraw Fire department will be hosting it's 9TH annual car show Sunday August 26th 2018. It is open to all antique fire apparatus, streetrods, muscle cars, antique cars and tractors , custom motorcycles and more ! All proceeds from the car show go towards the restoration and preservation of our antiques suach as our 1941 American La France open cab fire truck , and our antique hose and ladder carts, All of wich were original peices of equipment owned and operated by the McGraw Fire Department! There will be lots of craft vendors, games, and exibits by local groups. Music and mc will be provided by DJ-JOE AND THE KARAOKE SHOW ! 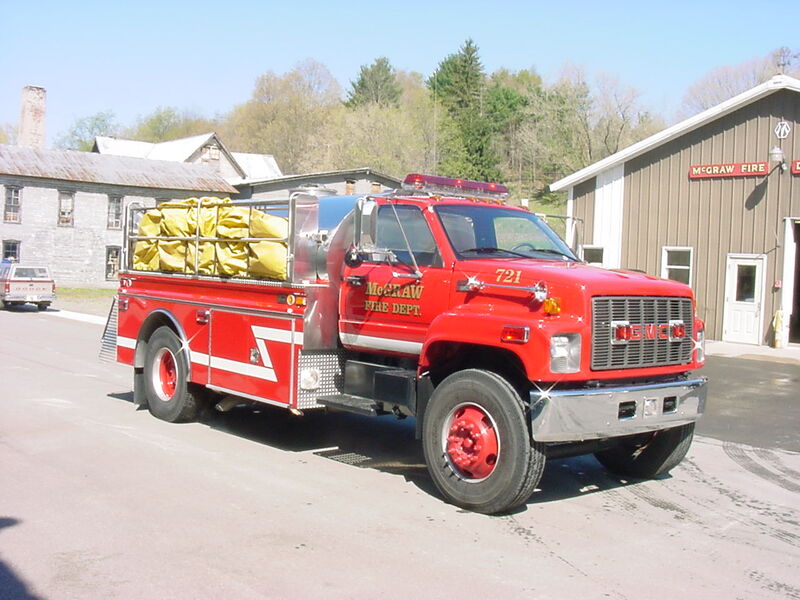 anyone interested in donating to the restoration of our 1941 American LaFrance firetruck or any questions regarding the car show, can call Joe Nauseef at 607-345-6156 or send me an e-mail at [email protected] or you can call the Fire Station at 607-836-4123 . We hope you all can come out and join us on Sunday August 26th at the Rec Fields on Clinton Street in McGraw ! The McGraw Fire Department is actively seeking new members for our department ! If you are looking for a way to serve your community , What better way that to become a vollunteer Firefighter! You can get your application from any current member , Or you can call the station at 836-4123 and leave a message and someone will get back to you!. If you have never been a firefighter but always dreamed of being one , don't be shy ! The State ,The County as well as The Department will provide you with all of the nescessary training and instruction to help you become a qualified firefighter ! We need help of all ages or gender ! There are several ways to help out ! such as being an interior Firefighter , an exterior scene support firefighter ( help with the exterior fire supression and fireground operations ), a Fire-policeman ( direct traffic and control the action around the scenes )........ We have needs in many different areas of the Fire Department. If you are over the age of 18 , we can accept your application now ! if you are younger than 18 years old , .... call us and ask about our Jr Firefighter program ! THE MCGRAW FIRE DEPARTMENT CAN HELP FILL YOUR POOL ! WE CHARGE $75.00 PER LOAD FOR 2,000 GALLONS OF WATER PER LOAD. CALL THE STATION @ 607-836-4123 AND LEAVE A MESSAGE , SOMEONE WILL RETURN YOUR CALL PROMPTLY.